Azimut's sporty fleet including the Open 68 S and 86 S, now comprises two new models introduced at the Genoa Boat show last year, the 43 S and the 62 S. The interior/exterior design is by Righini-Azimut and the décor by Carlo Galeazzi as was the case of the larger models. 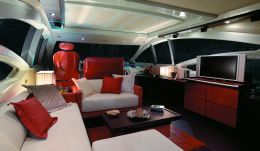 We had be possibility of testing the boat at sea in the waters facing Savona, an Azimut base in the Ligurian Sea. 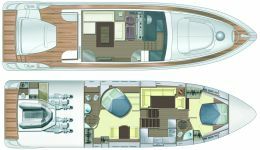 The yacht has the typical "family feeling" of the range, a streamlined outside line, a burgundy (not compulsory!) hull, ample panoramic side windows in the lower deck, mirrored windows with an aggressive design on the main deck and rounded stern. Compared with the previous models, a new detail was introduced: an opening window was added to the forward cabin for additional air and light. Interiors were radically modified; there are just two cabins, one forward and one aft: the cabin amidships was replaced by a small lounge. In this way, large families and groups of friends are excluded and the ideal clients are those preferring privacy and just one couple of guests, a bit like an open two-seater. Interior décor is contemporary but not minimalist and blends the contrasting tones of wenge wood and leather inlays in the flooring with the cream-colored fabrics and carpet. Light plays a special role: delicate and diffused by the satin ceiling belowdecks and by the backlit panels of the hanging cabinets. Abundant natural light is cast through the saloon and cabin windows or through the open hard top thus determining the solar and Mediterranean style of the yacht. Thanks to a special digital projection system fitted in the lounge belowdecks, guests may follow the course by watching all GPS screens and the radar screen; the same system allows to use the PC or simply to watch a movie chosen from a collection of 200 DVD's. During the boat test in the dark waters facing Savona, with moderate sea and wind, we appreciated the smooth movement of the hull in waves. Just a few details need improvement as is normally expected from a prototype. Maneuverability in harbor is excellent, with joystick-controlled synchronized bow thruster and stern propellers. In short, the 62S is fully entitled to appear side by side with the larger models and be considered a deluxe, sporty, young and vaguely informal yacht. 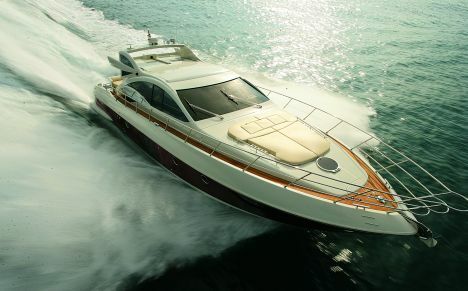 Price with standard equipment and test boat power: Euro 1,480,000.00 VAT excluded. 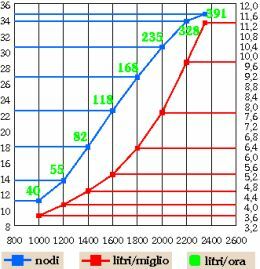 Consumption indicated in the graph is obtained by engine consumption curves supplied by builder, nevertheless the effective consumption at sea may differ from published data as a function of the loads and their distribution on board, of the navigating conditions, of the engines state and adjustment as well as of the characteristics of the propellers used. 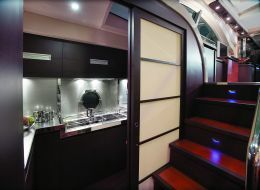 Layout and characteristics: access from the cockpit to the lounge is by means of a steel and glass sliding door. 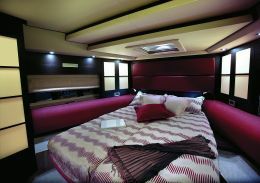 The opening ceiling panel contributes to a light and ample lounge where there are to port an L-shaped sofa with coffee&dinner table and to starboard two cabinets with radio-CD player, compartment with two folding chairs for the lounge and the retractable plasma screen. Several stainless steel grabrails are fitted inside. Descending the stairway in the lounge - with stainless steel handrail - one reaches the lower deck where there is a suitable compartment with washing machine and dryer in the landing. 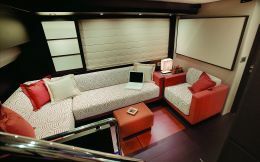 The lower deck lobby, with armchairs and a convertible sofa sleeper, serves as vestibule space for the two cabins forward and astern and the galley to starboard. The twin bed cabin - beds can be joined to obtain a double bed - is forward; air and sunlight easily enter the cabin through the hatch and the new side windows with opening porthole. Storing space is abundant and a vanity may be concealed when not in use. The bathroom, with two access doors, may be also used as day head. Galley: stainless steel Gaggenau galley with four ceramic hobs, wooden hanging cabinets, two stainless steel sinks with water mixer, microwave oven with grill, optional dishwasher, 230 liter refrigerator, extractor fan, sliding closing door. 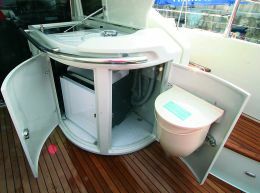 Standard fittings: air conditioning, 6.5 kW generator, lines and fenders, Raymarine C80 (here it is used as GPS and chartplotter), Shipmate VHF, autopilot, 1,700 W/24V windlass, hydraulically-operated gangway, bow thruster, maneuvering joystick in helm station, maneuvering joystick in cockpit, refrigerator and icemaker in cockpit, searchlight, winches in cockpit, Lantic entertainment system integrated with video projector belowdecks, 30" TV and DVD screen in the main lounge, lower deck lobby and Owner suite, 20" TV and DVD screen in VIP cabin and 15" TV and DVD screen in deckhand cabin. Cruising speed at 1,900/2,000 rpm's: 28,5/30,5 knots. Docking maneuverability: precise maneuverability with the joystick that coordinates the two engines with the bow thruster and the propellers. 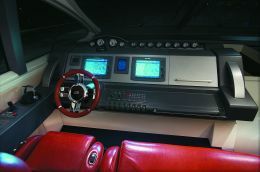 Electric switchboard and plants: general electrical switchboards are fitted in the engine room for direct current (24V) and alternating current (220V); specific switches are on the dashboard; Kohler 6.5 kW generator, 220V dockside electric connection, 24V/80A battery charger for engines and services, 12V/10A for the generator, service batteries (24V, 300Ah), engine batteries (24V, 150Ah), 12V generator battery, 220V outlets in interior spaces.